"I know that gold would be helpful, but think of all the things I can do with FOUR camels!!" If you find yourself saying this a lot, then Jaipur might just be the perfect game for you! The thing that makes Jaipur amazing is that it gives you tough decisions. The most obvious tough decision is when to sell your goods. Selling early can make each of your goods worth more victory points - yet, if you can collect enough to gain a 5-good bonus, then this can be worth 10 points! To add to the challenge, your opponent may also be trying to collect the same goods, and you are incentivized to trade before he does (you'll take the valuable chips). Since it is a strictly two player game, any points you keep from your opponent are just as good as points scored - so if you see that he's collecting leather, and you can swoop in and take the top two leather chips, then instead of getting chips worth 4 and 3 victory points, his highest valued chip will be worth 2! The next tough decision that Jaipur gives you is which goods to collect. Do you always collect the most valuable goods? If so, then it will be much harder to actually gain very many of them since there is a smaller number of them available in the deck (I think), and your opponent will also be trying to take them. Yet, if you choose not to collect the more valuable goods, then you are leaving your opponent uninhibited when collecting the most valuable goods! Plus, what happens when you have two copies of three different goods in your hand (the hand limit is seven), and there are two copies of the goods you need in front of you? You have to decide which ones to take, and what to put back, which then may give your opponent a collection of matching goods! 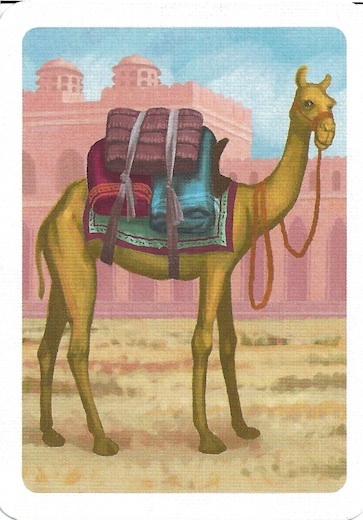 Finally, I really like the camels in Jaipur. I think that it is brilliant that you have a "camel herd" that doesn't count towards your hand limit. In all honesty, whoever is best at managing the camels is probably the player that will win. After all, whenever you trade in a large number of goods, it leaves your hand depleted. Remember, the only way to get more than one good at a time is to trade for them. So, if you have a large herd, then you can quickly replenish your hand by trading camels. But, if you sell a large number of goods and have no camels, then you will have to replenish your hand with a single card each round (until you decide to take all of the camels to build a herd). Really, the camels make the game unique and amazing - I cannot say enough good things about them... and they're pretty... for camels. I didn't really find any "cons" with Jaipur. However, it does have a very limited gaming appeal. By this, I don't mean that only certain people would like Jaipur - I really think that most anybody could enjoy it. However, it is only two player, and takes about 15-30 minutes. 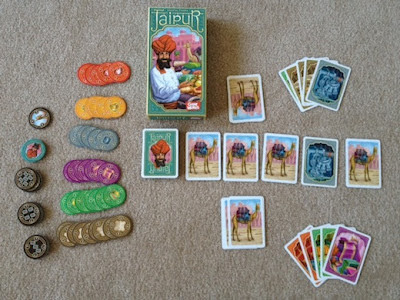 So, because of it's length, you probably wouldn't get together just to play Jaipur, and you also probably wouldn't play it 5 times in a row. Plus, with only two players, it's not especially amazing as a filler, because I normally have more than two people waiting around on game nights. However, with all that said, when you do need a short game for two players, it is amazing. And, obviously, the most common situation that requires two-player games is playing games with your spouse. I think that Jaipur works wonderfully for this, and in fact, I have played it with my own wife. Overall, I give Jaipur an 8.5/10. Again, if I don't see myself getting together just to play a game, then I don't like to give it a 9 or higher, but that is really the only criteria that keeps this score so low. However, it is in the upper echelon of filler games, in my opinion. I believe that everybody (not just gamers) should try Jaipur, and I plan to keep it in my collection for a long, long time. If you have a love affair with camels, you might also want to check out Through the Desert. Otherwise, some other nice little two-player games are Babel and Atlanteon. 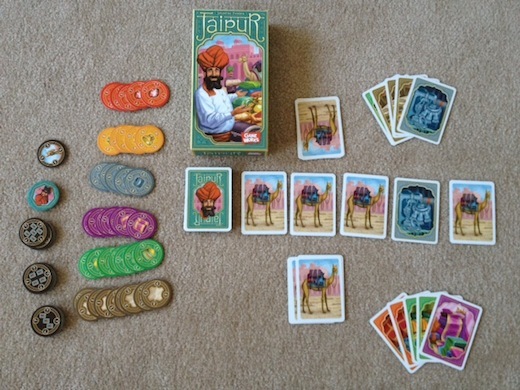 Or, if you want some more thoughts on Jaipur, check out I Slay the Dragon's Jaipur Review, or this other review of Jaipur by Games With Two. 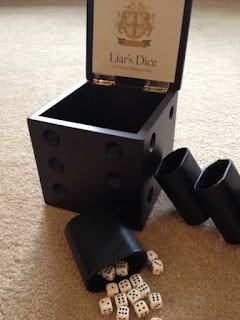 One of my favorite party games that I'm glad to get to tell you about is Perudo (also know as "Liar's Dice"). 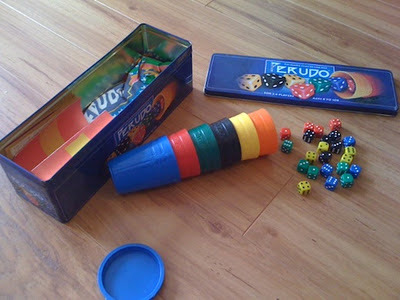 In Perudo, each player starts with five dice and a cup (to keep their dice secret). Each round starts with all of the players rolling their dice. Whoever lost a die most recently (first round, just pick someone randomly) starts the round. They must bid how many dice they think have been rolled among all of the available dice. For example, they may bid "five 4's", which means that they think that there are at least five dice showing the number four among all of the players' dice. To add to the fun, one's (or ace's) are wild and count as any number. 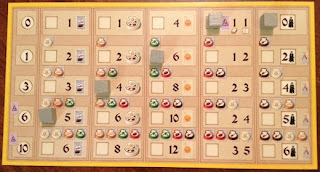 Now the next player must either increase the number on the die (and keep the number of dice at least the same), or they can increase the number of dice (so, in our previous example, both "five 5's" and "six 2's" are legal bids, but "four 6's" is not); or they can "call" the player before them, if they do not think that their bid is correct. 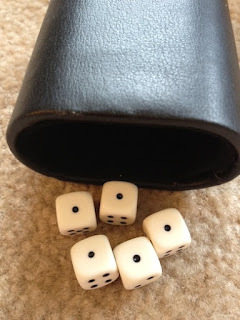 Once someone is "called", all players reveal their dice. If the necessary dice were rolled, then whoever called them loses a die; otherwise, the person who made the bid loses a die. There are some other special rules when a single player gets down to one die, and for how to bid on ace's, but this is the bulk of the gameplay. Play continues like this until only one player has any dice left. The first thing that I love about Perudo is the secret element of the dice. Since any given player never has more than five dice, the players have to completely guess what dice are present. Yes, you can use statistics to guess how many of each die there should be, but statistics always lie to you in Perudo. Because of this, it's great fun to start the game by bidding that there are 10 or more of some number, when you really have no idea. But, with six players (30 dice), 10 is probably a safe bet! The next thing that I like about Perudo is the mind games that you can play with people in the game. In a big game, your objective is simple - bid so high that the bid will not get back around to you, but just low enough that people will not call you! If I bid on something and five other people bid after me before I am forced to bid again, then this works out really well (after all, you can't lose a die unless you either call somebody or are called). However, the game can be just as fun when you have eliminated everybody but yourself and one opponent. It's a fun bluffing exercise to try to outwit your opponent when you know what dice you have rolled, he knows what he has, and you must still force his hand - and the less dice you each have, the better it gets. If we each have one die left, should I start by bidding "one 2", when I have a five, thinking that he won't call me? If I do, and he changes it to "one 3", should I call him thinking that he is using my same strategy? Final pro - it can also be played by anyone! Perudo is very non-traditional gamer friendly. With this, you can lie to anyone! With all the positive aspects of Perudo, there are really only two things to mention that can be considered negative. First of all, Perudo is a filler game. I don't really envision people getting together specifically to play it. However, since it could also be thought of as a party game, it is a game that I can see people being able to play often (like.... you know.... at parties) - especially non-traditional gamers. The other "con" (well, more "thing you should realize") is that there is player elimination in Perudo. Once you run out of dice, you are out of the game. However, since this game will probably be played at parties, this simply provides time to mingle, get a snack, go to the bathroom, or just chat with your other friends that were eliminated. Overall, I give Perudo an 8.5/10. I love Perudo and think that everyone should play it. 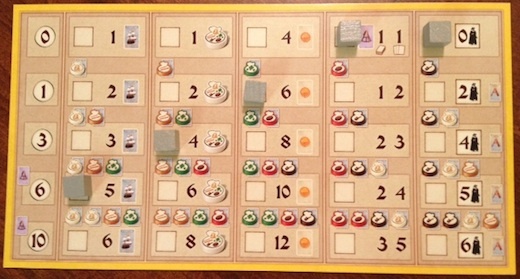 However, my (current) personal rule is that I reserve 9+ for games that I think people would get together specifically to play, which I don't think is the case for Perudo. If you're looking for fun dice games, you might also want to look into Cookie Fu, Martian Dice, and Rory's Story Cubes. 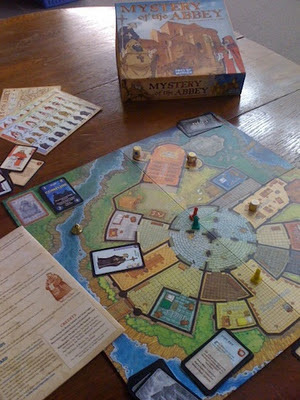 The original whodunit game by Days of Wonder is Mystery of the Abbey (which just came back in print). In Mystery of the Abbey, a murder has occurred! And, it is vitally important to determine who did the dastardly deed! To start the game, each player receives a handful of Catholic suspects (Fathers, Brothers, and Novices). Obviously, these people did not perform the murder, because they were too busy spending time in your hand. Each "round" consists of 4 turns per player. In any given turn, a player can move up to two spaces, ask a question of a player in his space (who, if he chooses to answer, can then ask a question back to the original player), and then perform the location's action. This action can be gaining extra suspect cards, getting various bonuses, or stealing suspect cards from other players. One of the crucial actions that a player can perform is to make an Accusation or a Revelation. An Accusation is when you declare a feature of the culprit - such as that he is Fat, Bearded, a Novice, or a Franciscan. This Accusation is written down and, if you are correct, is worth two points at the end of the game (and minus one point if it is incorrect). A Revelation is a declaration of who performed the murder - if you are correct, the game is over and you gain four points; if you are wrong, then you lose two points and miss a turn. At the end of each round, all of the players return to the Assembly Hall for Mass. 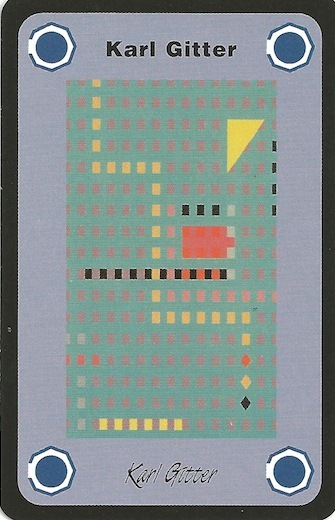 During Mass, players pass some suspect cards to the player on their left, and an event occurs. This event can range from beneficial, forcing everyone to reveal a suspect card, to downright odd, like forcing everyone to communicate only in song for the upcoming round. Once someone successfully Reveals the murderer, the game is over; however the person that made the successful Revelation is not necessarily the winner - whoever earned the most points from successful Accusations and Revelations is the winner. The first thing that I like about Mystery of the Abbey are the questions. This is really the crux of the entire game. Each time that you get into a room with another player, you have to ask them a question. And they have the option of ignoring your question ("taking a vow of silence"). However, if they choose to answer your question, they can ask you anything they want. And you are forced to answer. 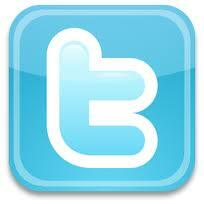 Therefore, you need to make sure that you ask a useful question so that you're not just giving away information. However, as powerful as this can be, it is kept in check by another limiting factor - all of the questions are public knowledge. Therefore, if I ask you, "Have you eliminated all of the Franciscans?" (a legal question), and you answer "Yes," then everyone in the game knows that the Franciscan suspects are innocent. I find this balance of asking questions that help me without revealing too much about what I have to be quite enjoyable. Another thing that I have grown to enjoy about Mystery of the Abbey is that you don't have to make the successful Revelation to win the game. At first I was quite hesitant about this aspect of the game. After all, isn't the point of the game to find the killer? However, I like that Days of Wonder took an alternate approach here. Yes, it is incredibly valuable to find the killer - worth twice as much as any Accusation! However, making several Accusations can reward the player who is able to most quickly decipher certain aspects about the killer. It also prevents someone from winning (as easily) by desperately guessing something at the last second. However, though I really enjoy Mystery of the Abbey, there are a few things that I dislike about it. First is the constant vow of silence strategy mentioned earlier - I think there should be a rule against this. Forcing the player to ask a question when he goes into a room with an opponent helps, but does not completely take care of the problem. Are we sure this isn't the guy who did it? 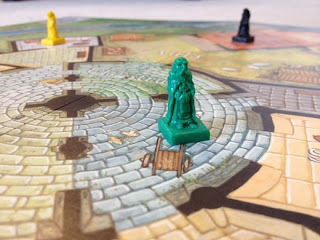 The second thing that I disliked about Mystery of the Abbey is that your movement is limited to two spaces per turn - yet the board is setup to where you often need to go three spaces to perform a room action. This causes a lot of turns to be spent only moving and (sometimes) asking a question. Of course, that question could be met with a vow of silence, so your turn could be completely unproductive towards finding out information about the killer. The last thing that I will mention is that, since you only pass cards to the left at the end of each round, a lot of what you are able to see is heavily influenced by a single opponent. For example, in one of the games that I played I was collecting as many suspect cards as I could. In doing this, I was able to steal a couple and take a couple from the parlor (extras after dealing out every player's hand). Because of this, I had about 8-9 cards in my hand. You never have to pass more than 6 cards. Therefore, since I kept track of some of the cards the player to my left had seen, I was able to regularly prevent them from having useful information. The other players had less than 6 cards. So, as the game progressed, they had less opportunity to hide information - the only person negatively influenced was the person directly to my left. And she was quite frustrated. And married to me. And so now I will try to make sure that she no longer sits directly to my left in Mystery of the Abbey. Overall, I give Mystery of the Abbey an 8.5/10. I looked forward to trying it out for quite some time, and I wasn't disappointed. 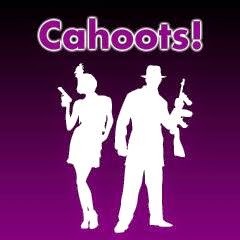 If you like whodunit games, this is one that I think you can play with your entire family. If you like Mystery of the Abbey, you should also check out Mystery Express, Cleopatra and the Society of Architects, and Ticket to Ride. Or, if you want another opinion about it, you should check out this review of Mystery of the Abbey by the Board Game Family. A game that sat in my "to play" pile for far too long because of timing issues (and not play issues) is Goa. 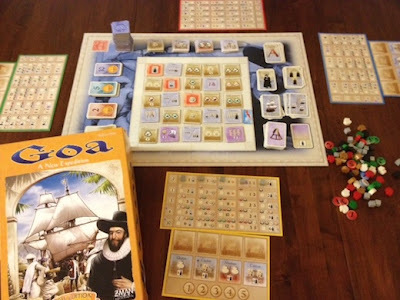 In Goa, each player takes on the role of a spice merchant attempting to gain the most prestige by discovering plantations, selling spices, and upgrading their shipping infrastructure. 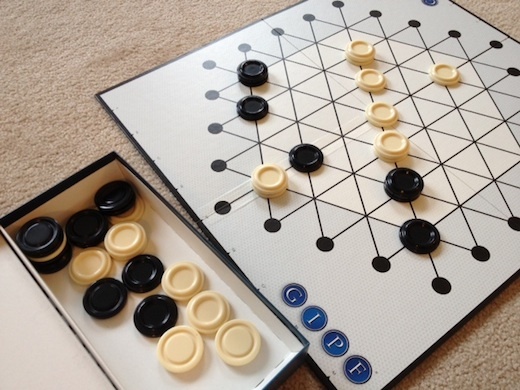 The game consists of two phases, each consisting of four rounds. To start each round, the first player will place a flag (the first player marker) along with an auction indicator next to any of the tiles in the center of the board. In turn order, each of the other players will place an auction indicator on one of the tiles adjacent to the previous one, followed by the first player placing a second auction indicator. After this has occurred, each of the tiles will be auctioned in order - with tiles representing colonsits, ships, plantations, victory points, and more. After the auction, players take turns performing actions until each player has performed three. After the third action, players with extra action cards may perform bonus actions (or carry one bonus action into the next round). Actions consist of gaining ships, replenishing spices on your plantations, collecting income, drawing expedition cards, and attempting to establish colonies. Finally, a player may also take an action to spend spices and ships to upgrade any of the previous actions. 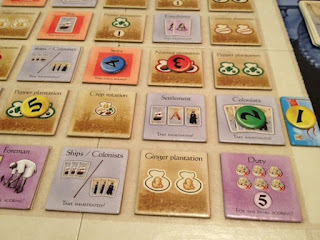 At the end of the game, players will get victory points for how much they have upgraded each of these sections of their board, how many colonies they have established, what cards are in their hand, and from tiles that they have purchased. Whoever has the most points wins (yes, yes, this sentence is normally a given, and maybe I should stop bothering to type it)! The first pro that I have for Goa is that I think that the auction system is very interesting. Specifically, I like that where you place your auction indicator affects where the next one can be placed. So, as the first player, you want to start off by placing near the tiles that you need. Yet, each other player is going to attempt to place their tile on the one that they need (or think they can make the most money from), so the tile the first player still might not be auctioned. 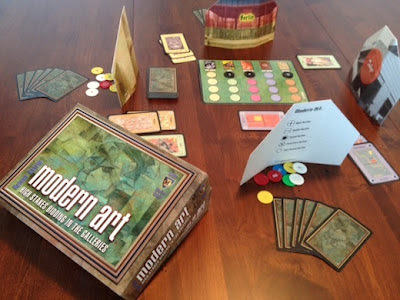 In addition to the creativity of this initial placement, the money changing within the auction is another important aspect of the game (and so should also fall in the "pro" category). Specifically - when you buy a tile, you pay the person that has put the tile up for auction (or, they have the option of purchasing the tile for one less than the highest bid). The only use for money in Goa is buying tiles (though the person with the most money at the end also gets victory points). This means that a player that collects far more in taxes than the other players will have his pick of whichever tiles he wants to purchase - and will do so, since there's no other use for all that tax money. Yet, since he has to pay that money to another player, if he is not careful, he may enable one of his opponents to have enough money to outbid him on the next tile! The second thing that I like about Goa is that everything feels vitally important. You always feel like you're doing poorly in the game, because one of the other players will inevitably be doing well in whatever area you need at any given moment. Do you have all the ships and spices you need? Well, then you probably had to neglect taxes in order to upgrade those things. So, during the auction, you're going to feel like you're getting obliterated. Have plenty of money? You're going to feel like you can't colonize. Do you feel like you have a little bit of everything? Then you're not earning many points in any area! (You score 0, 1, 3, 6 or 10 points depending on how many times you've upgraded each section.) Yet, this feeling of doing poorly isn't depressing, but just makes each decision that you make feel very important. And, you want to do everything now, dangit! But, unfortunately you only have three actions per round. Which then makes buying extra actions feel critically important! A side effect of how many different difficult choices exist in Goa is that you are able to win with a large variety of strategies. You can win by dominating the auction, upgrading better than other players, getting a lot of expedition cards, etc. I appreciate games that allow for varied strategies to all be successful, and Goa definitely falls into that category while providing a very tense, satisfying game experience. With all of the brilliance of my pros, there are a couple of nitpicky things that I should mention as cons. 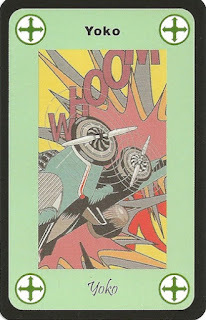 First, I don't really like how expedition cards score points. 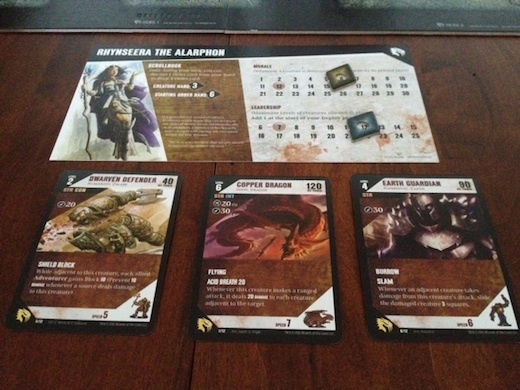 Each expedition card has a symbol in the bottom right-hand corner. This symbol means absolutely nothing in gameplay terms. However, at the end of the game, you get points based on how many symbols you were able to match (again using the 1, 3, 6, 10 scale). This makes absolutely no sense to me, though I realize that if this weren't in place, then the expedition cards would quickly become unbalanced. If you scored simply based on how many you had (with the escalating scale), then they would be far too valuable; and if you made them not worth any points, they wouldn't be valuable enough. Yet, this forces you to make strange decisions about which cards to play, and allows the "luck of the draw" (drawing matching symbols) to swing the game by a few victory points in a game where less than ten points may separate first from last. My other con is even more trivial. It is simply that a player with a lot of money will probably maintain the first player flag for much of the game. Now, this really depends on your play group and how much they allow this to happen. However, if one player collects four more dollars in taxes than all other players, then an extra action is worth four more dollars to him than all other players - after all, he can easily just use the action to collect income. (Yes, I realize that it doesn't break down quite this way if you think of it in terms of potential victory points, but if you look at it strictly from a "what I spend versus what I can receive" perspective, then my statement is true.) The only way to prevent this from happening is to spend enough money that the cost of keeping the first player marker is not worth the value gained for this rich player. Yet, the money that you spend to take it away goes to the former first player (the rich guy), and so you actually may be helping him more by buying it from him! However, being the first player (and getting the extra action) in no way guarantees the win, so this ultimately isn't a huge deal. As I said - it's a minor complaint. Overall, I give Goa a 9.0/10. I enjoy the game quite a bit, and I think that it is a perfect example of an incredibly well balanced game with many strategies that can be victorious. And, since those are two things that I look for in games, it should come as no surprise that Goa scores very highly in my opinion. If Goa sounds interesting to you, then you might also want to check out Alien Frontiers, Princes of Florence, and China. I would like to thank Z-Man Games for providing me with a review copy of Goa. 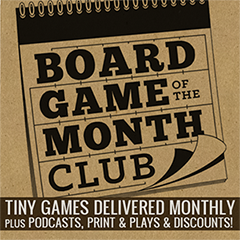 So, I am pleased to introduce you to Board Game Reviews by Josh's first guest reviewer - Chris Casinghino. Chris plays games with me on a regular basis in Philadelphia, and we seem to have similar tastes in games. He told me one day that he liked "the new and the shiny" when it comes to games, and what better way to try out those new games than to help write blog posts, right? Anyway... off to his review of Belfort! 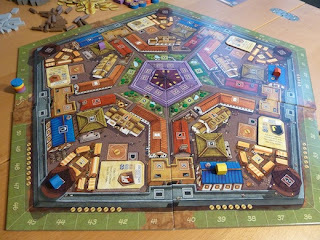 The castle of Belfort needs constructing, but there’s a problem: the King has accidentally hired several architects instead of just one. You must outdo the other architects by recruiting the most Dwarves, Elves and Gnomes and using them to construct as much of the castle as possible before Winter comes. 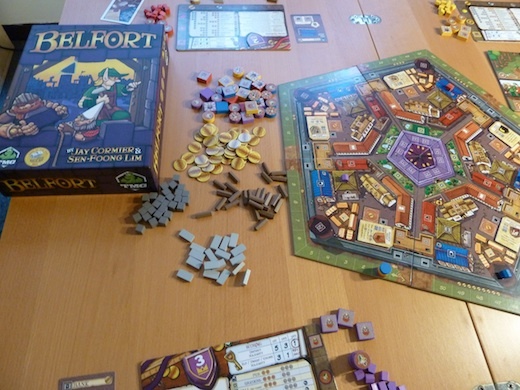 Belfort combines worker placement mechanics with area majority scoring. 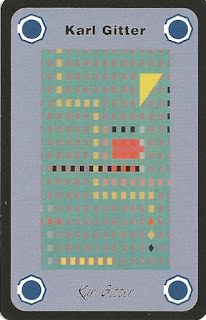 The game occurs over 7 rounds where players use their workers at spaces in the city to gain resources and more workers. Each round, players can use their resources to construct parts of the castle, unlocking new action spaces. Players earn points both for having constructed the most buildings in each section of the castle and for having recruited the most workers of each type. A scoring phase occurs at the end of the third, fifth and seventh rounds, and players who have been more successful will owe more taxes to the King in subsequent rounds. While Belfort isn’t the first game to combine the worker placement and area control mechanics (see Alien Frontiers and Dominant Species) I found the implementation to be very fun and elegant, with plenty of neat little ideas. For example, when players build a new section of the castle they both place a marker on the board (for area control) and unlock a new action space that only their workers may use. These buildings come in 10 types, each with a different cost and providing a different action space or benefit. Players start the game with a hand of three building cards, and can get more as the game goes on. Restricting players to a hand of buildings elegantly prevents the number of choices from becoming overwhelming while still leaving enough room for strategic play. There are a couple other gameplay elements that I really enjoyed. First, players who earn more points in early rounds will owe more “taxes” in later rounds. This very simple catch-up mechanic is helpful to players who get behind early without feeling burdensome or unfair to the leaders. Second, the game comes with a collection of 12 action spaces called “guilds”, but you only play with five each time. These spaces are often quite powerful, and they change the game in exciting ways. Each game I’ve played has felt quite different, so I think the guilds really enhance replayability. They are divided into three types (“basic”, “resource” and “interactive”), so you can customize the game by picking more guilds of the types you like. This is also a great avenue for future expansions (in fact, TMG has already put out some promotional guilds). and very helpful - the designers managed to pack in reminders for the starting set-up, the round structure, the cost of all the buildings and the scoring on each board all without making them feel cluttered. The other components are wonderful as well. The artwork on the boards and pieces is bright, colorful and whimsical. Unusually, the main castle board is a large pentagon, and the fifths slide apart for easy scoring of each section. There’s a lot of nice cardboard in here - in addition to the castle, there are two other boards with action spaces and five player boards. The player pieces are thick wood and the game comes with nice Elf, Dwarf and Gnome stickers for the workers. Overall the game is very nicely produced and packed with fun bits; I was surprised when I saw how much came in the box. The game does have one problem, which is its length and the amount of downtime. The box says it plays in 90-120 minutes, but that’s optimistic for your first games (especially with 4 or 5 players). Our first four-player game took nearly three hours. 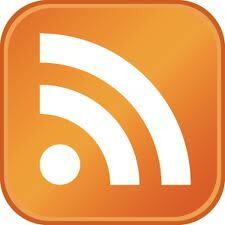 More, there is a substantial amount of downtime. During the “action” phase, each player takes as many actions of various types as they would like (building properties or recruiting gnomes, for example). Other players must wait for them to finish, and if you are playing with many “interactive” guilds it can get tricky to plan your turn ahead of time. This can get particularly bad in scoring rounds, where AP-prone players (Josh's note: AP or "Analysis Paralysis" is when a player has so many potential decisions that he cannot choose which one to perform) may spend a long time calculating how each possible combination of actions will change their score. 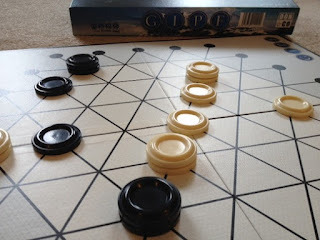 Our subsequent games have been a bit quicker, but with players who have trouble keeping a game moving consider leaving out the interactive guilds or leaving this game on the shelf. With fun, strategic game play, beautiful production and an exceptional rule book, I’d recommend Belfort to almost any gamer. 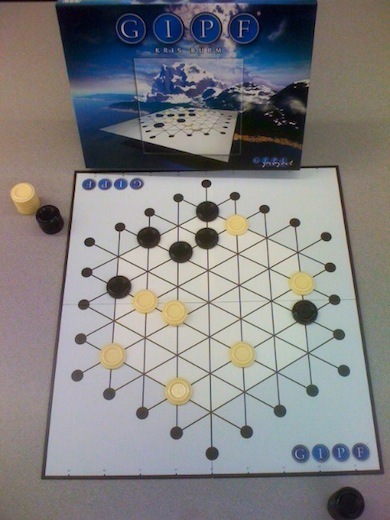 Everyone should try it, and it’s a must-buy for fans of deep worker-placement games. 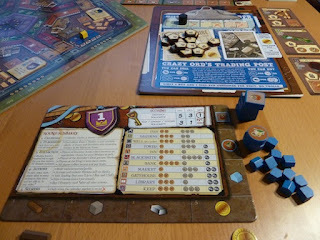 Board Game Reviews by Josh would like to thank Tasty Minstrel Games for providing us with a review copy of Belfort, and, of course, would like to thank Chris for his great review! 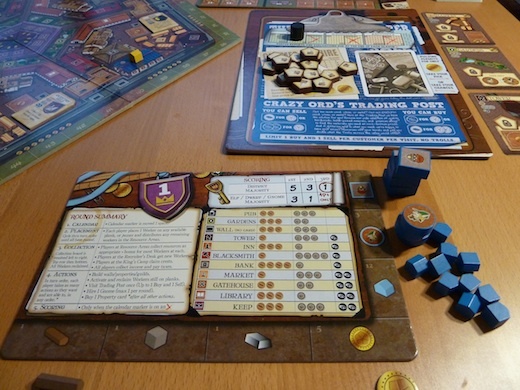 If Belfort sounds interesting to you, you might also check out Stone Age, Caylus, and Age of Empires III. One of the prettiest games that I've had the opportunity to play recently is Dungeon Command. 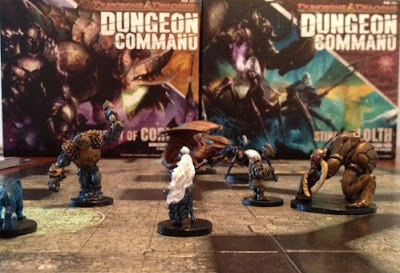 Dungeon Command is a two-player skirmish game that uses Dungeons and Dragons minis. Each player builds their army (or uses a faction pack) and attempts to reduce their opponent's morale to zero. 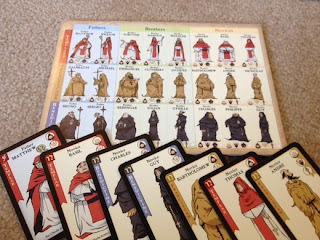 To start the game, each player takes a leader - which gives them a certain number of character cards and order cards in their hand; as well as a starting leadership value, morale, and a special ability. Using your starting character cards, you will play forces - with a total value up to your leader's leadership value. Now, you are ready to play. Each turn, you can activate each of your units once. This includes moving and attacking, playing an order, or activating an ability. You can also play any number of "minor" orders on a minion each turn. When attacking, damage is simply dealt to the targeted creature - there is no die rolling to determine success (and, if you destroy them, then their controller loses morale). However, the defending character has the option of playing orders from his hand, or he can "cower." If he chooses to cower, then he loses morale equal to the amount of damage that the minion would have taken (divided by ten - for example, 20 damage loses two morale). Once you are done activating all of your characters, your leadership value goes up by one and you have the option of playing more forces - again, up to your (new) leadership value. Play continues until either only one player has troops on the board, or until one player has run out of morale. The last leader standing is the winner! My first pro for Dungeon Command has absolutely nothing to do with Dungeon Command. When Wizards made this game, they decided to make all of the characters valid to use in their Dungeons and Dragons adventure games (like Legend of Drizzt and Castle Ravenloft). That is absolutely amazing! Plus, my biggest complaint with the D&D adventure games was that it felt like you were playing the same game each time - there were only so many monsters, and you encountered them repeatedly. Buying all of the different adventures helped a little bit, but not terribly much. 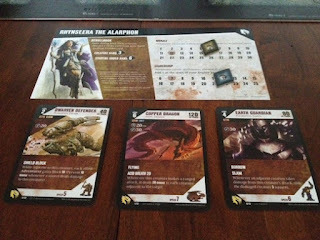 However, now with Dungeon Command, you have the ability to play those games with a lot of different monsters! I applaud Wizards of the Coast for doing this - I think that it is a brilliant business model, and it also is something that is great for their customers. I am also hoping that they decide to make all of the enemies in Drizzt and the other adventure games playable in Dungeon Command, but I haven't heard anything about that yet. The second pro that I have for Dungeon Command is that I enjoy the combat system that doesn't include dice. Honestly, I'm not opposed to dice, and the skirmish game that most reminds me of Dungeon Command (Summoner Wars) uses dice. However, if you play games with me, you will realize something - I am horrible at rolling dice. I'm inevitably the guy that needs to roll a 3 or higher on 15 dice to win the game, and I will roll straight 1's and 2's. That may be a bit of an exaggeration, but I do occasionally get frustrated with dice. Now, just because there are no dice in Dungeon Command doesn't mean that there's no randomness involved. Between drawing the creature cards and the order cards, there will still be a random factor. If you draw all low level characters to start the game, for example, then your attack strategy will have to be much different than if you had drawn all dragons and amazing wizards. Either way, I think that the combat system is actually pretty intuitive because of the lack of dice. It also helps you plan out your strategy more during your opponent's turn - you can see exactly how much damage you need to deal to a creature to kill it, and you can plan accordingly (and assume that your opponent will not cower - though them cowering can be very good for you). 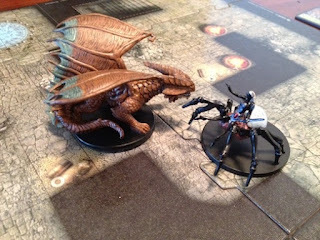 Speaking of cowering, I think that it is another positive element to Dungeon Command. I don't know that I've ever played a game where you can just flat-out ignore damage. Granted, it hurts you considerably to do this, but it is still an option. If I have a gigantic dragon that is about to unleash a massive attack on my opponent, but he gets attacked for just enough to kill him, I can choose to just take the damage as morale hits and then proceed with my attack. Now, it is very important to choose wisely about when you want to do this, as you can end up losing far more morale by keeping a unit alive than by letting him die (and so, often isn't worth it with one of your wimpy little guys). But, if that character is going to be dealing the deathblow to one of your opponent's better minions on the next turn, it might even be worth it to allow him to cower (after all, it's more fitting for little twerps to cower than for your Umber Hulk, but sometimes even the big guys have to live to fight another day). Now, with all of the things that I do like about Dungeon Command, the biggest negative is definitely the price. A faction pack comes with 12 figures and 36 order cards for an MSRP of $40. That's somewhat pricey, but not totally out of line for a miniatures game. However, you really need to have two faction packs to play the "full" game - which means you already have an $80 investment in the game without any customization (yes, I realize that you can buy this on Amazon for a bit cheaper, and I even provided you the link above). However, another neat element of the game is that you can customize your forces - putting extra copies of some orders and creatures in your deck, and removing others (and, in fact, I think that you'll probably get bored playing with just the basic factions). But, to do this, you are going to be buying even more faction packs. So, I think, to really play Dungeon Command and to get the most for your money, you're going to need friends that also enjoy the game enough that you are each providing your own figures. For example, if I enjoy the Drow, then I may get two copies of the Sting of Lolth set, and expect my friend that I'm going to play against to buy a copy or two of the Heart of Cormyr faction pack. Overall, I give Dungeon Command an 8.5/10. If you enjoy the Dungeons and Dragons adventure games (and own them), then you should buy this game! If you are just looking for a two-player skirmish game, then this is definitely one to consider; essentially, you just have to decide how much you're willing to pay for your skirmish game. 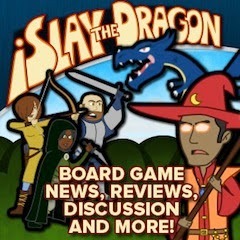 If you want a second opinion, check out Play Board Games' Dungeon Command Review. Or, if you want to read about games similar to Dungeon Command, then you should definitely check out Summoner Wars, Legend of Drizzt, and BattleLore. I would like to thank Wizards of the Coast for providing me with a review copy of Dungeon Command.